The archaeological evidence indicates that from at least as early as the second millennium BC seagoing ships were making their way between the coasts of northern and western Europe, carrying people and goods over long distances. We have already noticed the importance of skin or hide boats in colder waters and it is clear from several Classical Roman writers that this type of vessel was considered highly suitable for the mariners of France, Ireland and the British mainland. A framework of relatively slender timbers with hides stretched over it was also very light in weight, which was another useful feature for mariners who would often need to carry their craft over considerable distances and also be in need of extra buoyancy. 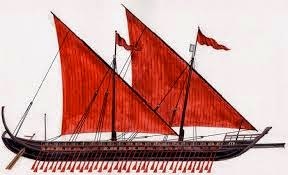 Both sails and oars were used for propulsion, but very large oared galleys of the Mediterranean type were employed by the Romans only when their naval forces operated in northern waters. Early medieval seafarers in north-western Europe and Scandinavia used the virtually double-ended vessels with upswept prow and stern characteristic of many later medieval craft. These features enabled the ships to be beached and launched easily and were useful when running before the wind, which seems to have been a favoured sailing technique. The building method was usually shell-first and consisted of light, overlapping planks, laid clinker-fashion, fastened to the keel by lashing, strengthened by strakes and attached to each other by iron clenches. By the ninth century ad Nordic shipwrights had developed a vessel type with a fairly broad keel that relied mainly on a single square sail for propulsion, with the oars being an auxiliary power source for use in calm weather or inland waterways. The typical Viking raiders’ ship was a buoyant, fast sailing vessel that needed very little depth of water and few or no docking facilities. Ship designs were adapted to suit the needs of the communities that used them. The Norwegian and Danish vessels that crossed the North Sea and the Atlantic were generally smaller than the Swedish ones that operated in the Baltic, sacrificing carrying capacity for seaworthiness in the harshest of conditions. By the thirteenth century the Scandinavians and their Germanic neighbours were using bulkier, less elongated ships for trade and even military activity. There were two predominant types, the hulk, or hulc, a word which originally seems to have meant something hollowed out like a peapod and was characteristically banana-shaped, with a curving hull, high prow and stern, but little or no sternpost or stempost. Side rudders were commonly used for steering. A good depiction of this type can be seen on the fourteenth-century seal of Winchelsea. The hulk may have originated in the Low Countries, but it spread to England and across northern Europe and was the most common cargo vessel of the fourteenth and fifteenth centuries. The other was the cog, probably of Frisian origin, and distinguished by its angled prow and stern, flat bottom and high sides. The cog was the preferred vessel of the Hanseatic traders in the twelfth and thirteenth centuries. Both had a main square sail on a mast fitted amidships. Gradually larger sails and more masts were added. Stern-castles and fore-castles were used on both merchant and naval ships. One reason for the development of the hulk and the cog may be that harbour duties and maritime taxes encouraged merchants to use fewer, larger ships. Another reason may be the adoption of the centrally mounted stern rudder, gradually introduced to northern Europe in the twelfth and thirteenth centuries, which could be more easily incorporated in these types of ships. It has also been argued that high-sided sailing ships were more difficult for pirates to attack. By the sixteenth century, however, three-masted ocean-going vessels based on a sturdier, more flexible skeleton-first form of ship construction began to replace these earlier types. 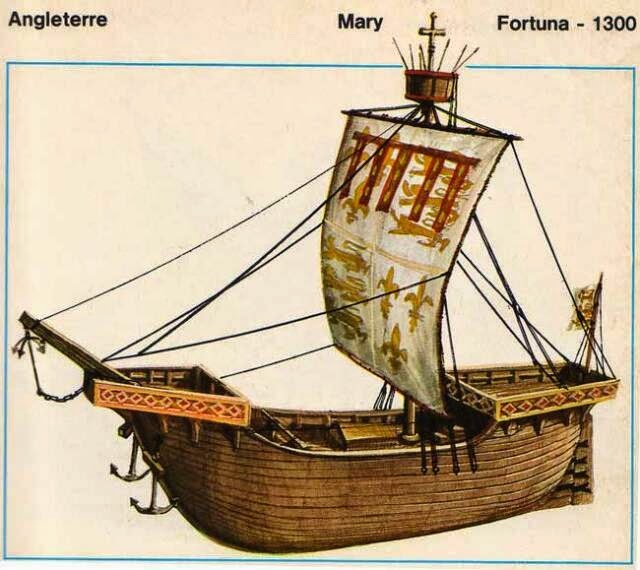 The ships that launched European seafarers across the oceans of the world in the fifteenth and sixteenth centuries represent a combination of design and construction elements from the maritime traditions of the Mediterranean, the Indian Ocean and northern Europe. The caravels that were the favoured ships of the Portuguese in the fifteenth century had blunt, transom-built sterns with large rudders. They were carvel-built, that is with the planks joined edge-to- edge, rather than overlapping in the northern style. They could carry both square and lateen rigged sails, as Vasco da Gama’s fleet did in his epic voyage to India, using the former style in the Atlantic, but converting to the latter style in the Indian Ocean. Over the next few centuries the main developments in European shipping were in terms of size and speed. Sailing ships were made larger and sleeker, and were rigged with more masts and sails to use the available winds as effectively as possible. Displacements of a few hundred tons were typical of the ships of the late sixteenth century, but in later centuries ships displacing a thousand tons or more were built. Bulk cargoes, carried over long distances in large, fast ships also required protection. The Spanish, needing to transport the wealth of the New World in large amounts and securely, developed the most celebrated ship of the sixteenth century, the galleon, a long, single- or double-decked, ocean-going ship with sharply raised foredeck and quarter-deck and a hull pierced with ports for heavy guns. It was the increasing number of guns on the European warships of the sixteenth, seventeenth and eighteenth centuries that were to make them particularly effective against the ships and coastal fortifications of the Orient. The Chinese, for example, had long used artillery in warfare, but they did not employ large guns on their ships. Strong metal tools, initially made of bronze, were obviously a major element in the development of shipping technology. They were available in central Europe by the early fourth millennium bc and were introduced into the Mediterranean and Near East probably a little later. By the latter part of the third millennium BC wooden ships large enough to carry cattle were being used to ferry animals between the mainland and Cyprus. Oars and paddles were the methods of propulsion employed by the earliest seafarers, but by the end of the fourth millennium BC the sail was being used in the Mediterranean, the Red Sea and the Indian Ocean. We cannot say where or when it was first developed, although it seems likely that there were several, roughly simultaneous ‘inventions’ of the sail in these regions. The idea of attaching a broad wind-trap to a post or pole, fixed to the body of a ship, in order to use the wind to propel the vessel is taken so much for granted nowadays that we can easily overlook how ingenious and bold the concept must have seemed to those who saw it for the first time. The sailing ship is one of humankind’s great technical innovations, to be ranked alongside the potter’s wheel or the printing press in the history of civilization. Wooden sailing ships were to be the preferred means of maritime transport in the Mediterranean and adjacent regions for nearly two thousand years. By the middle of the first millennium BC the two main methods of propulsion, sail and oars, were in widespread use across the Mediterranean region and beyond. Ship designs had begun to specialize according to function. The typical seagoing vessel of the first millennium ad might use oars or sails or both. There were many variations in the size, the depth, breadth and length of its hull, according to the needs of the ship’s owner. The long, multi-level oared warship with a ram on its prow, best exemplified by the celebrated trireme and quinquereme, is the type of vessel most readily associated with ancient seafarers. Yet these impressive-looking galleys with their huge crews of oarsmen were only for naval use. Less elegant, shorter, more rounded ships with a greater cargo capacity would have been commonplace in the harbours of the Mediterranean, the Red Sea or the Persian Gulf. Warships were far less specialized outside the Mediterranean, where rougher seas and stronger winds made the oared galley less effective and where naval activity was less regular. The number of masts and the types of sails used by ancient mariners varied considerably, as did the techniques of building, rigging and sailing seagoing ships. By the third century AD the square sail was being gradually supplanted by the triangular, lateen sail, which, together with multiple oars, offered considerable advantages in the relatively calm conditions of the Mediterranean. A major advantage of the lateen sail is that it can be cut much larger and baggier than a square-cut sail, and thus it will catch and use the wind more efficiently, especially when sailing to windward. Exploitation of the monsoon winds, which was widespread from c.600 BC onwards, led to much larger, sturdier sailing vessels in the Arabian Sea and Indian Ocean. From an early stage, therefore, the shipbuilders of the Arabian Sea produced sewn plank boats with lateen rigged sails. These were the ancestors of the dhow, a term used by Europeans for a range of sailing vessels. Looking further afield it is not surprising that light, bamboo and timber craft with outriggers were very popular in South-east Asia, especially for use in shallow seas and among the islands. In these seas and elsewhere experiments with sailing rig, steering methods and other aspects of seafaring gradually produced a diversity of ships built and sailed according to the dictates of local conditions. In general terms the factors influencing maritime ship design were similar throughout the world. They include the range of locally available materials, cargo sizes and weights, costs of crews (important for both merchant and naval requirements), the typical strengths of winds and currents and the depths of coastal waters. The interplay of these factors was complex. For example, larger cargo ships were produced where the cargoes were usually in bulk (e.g. timber, cloth, grain and cheaper metals), whereas smaller vessels might be favoured for luxury or high value cargoes (e.g. gold and ivory). But very large cargo ships were not common until more recent times, partly because individual merchants or ship owners lacked the resources and capital to produce them and run them effectively. Only the very rich or the ruling elites could afford to use them. A compromise was often sought in terms of mixing bulkier and smaller cargoes so that the typical merchant ship or trading vessel of the pre-industrial era was of a modest size and crew.